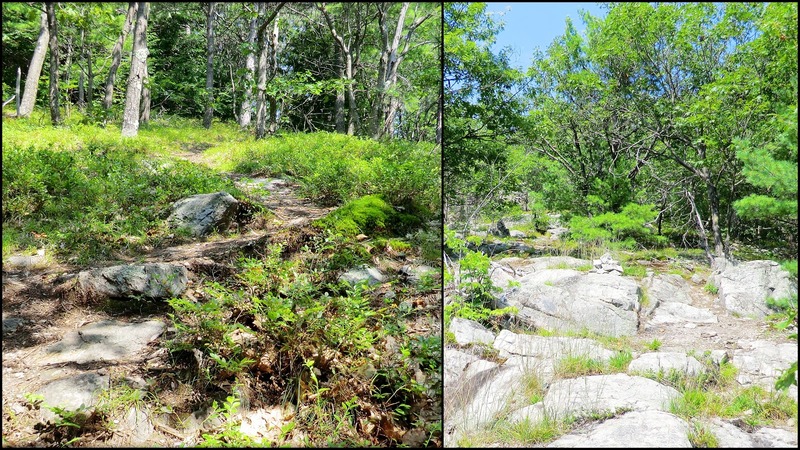 The Maine Chapter of the AMC, along with assistance of the Friends of Burnt Meadow Mountains, have recently done some remarkable work to further develop and improve the trail system at Burnt Meadow Mountain and Stone Mountain. Since I had never hiked at this particular location, I decided to drive over to Maine and check it out. It's always such a thrill to experience any hike that is new to me! The trailhead is located less than 2 miles south of Brownfield, ME on the west side of Rt. 160 about a tenth of mile south of the Public Boat Launch at Burnt Meadow Pond. There are directions at the website for the Friends of Burnt Mountain Meadows (click HERE). From the trailhead (430 ft elevation), the blue-blazed Burnt Meadow Trail leads you 1.3 miles to the north peak of Burnt Meadow Mountain (1,575 ft elevation). So, when you do the math, that's nearly a 1,200 ft. elevation gain over a relatively short distance of 1.3 miles. Although it isn't a difficult hike, the climb is more than you might expect for a mountain that is just a tad above 1,500 ft! Also, it should be mentioned that just below the summit, you need to do a scramble up a steep, rocky ledge (see photo below) Again, it isn't overly difficult, but is something good to know beforehand. On your way up to Burnt Meadow Mountain, there are several open ledges which provide views of low-lying mountains in western Maine. Shown below is a typical vista. Also along the way, there is a spot where you can catch a view of Pleasant Mountain (next photo) which is located about midway between Fryeburg and Bridgton, ME. As you ascend, there are ledges which allow you to see your destination, i.e. Burnt Meadow Mountain's north peak (see next photo). From the summit of Burnt Meadow Mountain's north peak, there are particularly nice vistas to the east and to the south. To the west, there are some views of high peaks in New Hampshire, primarily in the Sandwich Range. However, there are better vistas to the west and northwest from various ledges along the Twin Brook Trail. Using the Twin Brook Trail enables you to do a loop hike. It is unsigned from the summit of Burnt Meadow Mountain. However, you can easily find the trail by heading westward along the summit and turning left onto a pathway near a large cairn. You'll soon see yellow blazes which will guide you on a 2.0 mile trek back to the Burnt Meadow Mountain Trail. As mentioned a few sentences ago, there are nice views of high peaks in New Hampshire from ledges along the Twin Brook Trail. These ledges are at the upper end of the trail. The best vistas are obtained by going to unmarked outlooks just a few feet off the main trail corridor. Please be assured that the main trail is always in full sight. It's not a bushwhack! Unfortunately, on the day of my visit, the westward views were very hazy. Nonetheless, the photos shown below might provide a general idea as to the types of vistas that are available from ledges along the upper end of the Twin Brook Trail. The top part of the Twin Brook Trail has soft footing and easy grades. The lower portion of the trail becomes more rocky as it descends steeply to the col with Stone Mountain. The next photo shows a segment of the upper end of the trail (left), and a segment of the lower end (right panel). Diverging from the Twin Brook Trail is the Stone Mountain Trail which just opened in 2010. This junction is marked with a sign. The blue-blazed trail leads you on a 0.72 climb to Stone Mountain. The corridor is very well laid out with several switchbacks. Even though there is nearly a 500 ft elevation gain, it's barely noticeable! Once you reach the crest of the mountain, one branch of the trail will lead you straight ahead to ledges on the south flank of Stone Mountain. Another branch diverges to the right and will lead you northwesterly for a short distance along a faint pathway to the summit of the mountain which is located in a large field filled with blueberry bushes! The vista from the ledges is predominately a view to the south and east. The next photo shows the southward view. The main vista from the summit of Stone Mountain is a westward view toward high peaks in the Sandwich Mountain Range of New Hampshire. As mentioned earlier in this report, the westward vistas were very hazy on the day of my hike. Nonetheless, the next photo will perhaps provide a general idea of the view from the summit. This 4.8 mile loop involved hiking the entire distance of all three trails, i.e. Burnt Meadow Mountain Trail, Twin Brook Trail, and Stone Mountain Trail. Shown below is a trail map which is publicly available on the website for the Friends of Burnt Meadow Mountains. To sum it up, I was very impressed with the trail system at the Burnt Meadow Mountain location. And despite the hazy conditions looking westward, I still experienced some pleasant views. Definite consideration will be given to making a return visit on a better viewing day. Burnt Meadow Mountain was one of the first peaks I hiked to, when I started hiking again three years ago. I returned there, at about this time last year, and it did not disappoint. It was easier than I remembered, but two years, and being in much better shape, does things for ones perspective. Thanks for the report, it's a reminder to return here soon. Not to mention, it's only about 40 minutes from Portland! Wow! Didn’t realize that the Burnt Meadow Mountain trailhead is only about 40 minutes from Portland. That’s half the time it took me to get there from my home in Bethlehem! When gathering some background info for my Blog report, I came across your report about the trek you did to Burnt Meadow Mountain in August 2012. It was fun to read about another hiker’s adventure at this same location. I’m posting the link (see below) to your report for other readers to enjoy. Thanks for your comments . . . much appreciated! Excellent report, John! I really enjoyed this one the one time I did it a few years ago. At that time the other trails had not yet been opened, so I made a bushwhack loop by descending the next ridge. Wish this one was closer to us! Yes, it is unfortunate that this attractive venue is a bit of a drive from both your home in Lincoln and mine in Bethlehem. However, now that I have a much better feel for how long the hike takes, etc, I might consider making a return visit on a better viewing day, and then combining it with another short hike that same general area. I've just returned from a week's vacation at the Jersey Shore and I see you've been busy blogging! Very nice report, John. I liked the openness of Burnt Meadow; it reminded me of the many "bald" mountains here in the west. This loop hike has it all—interesting terrain and great views. How far is this trail from your home? It's great that you can take advantage of some great hikes in a neighboring state. Looks like another fun excursion! I’ll be looking forward to some blog reporting about your vacation at the Jersey Shore! Regarding your question about the distance from my home for the Burnt Meadow hike, it takes about an hour and twenty minutes to drive to the trailhead. It’s a bit further than I normally drive for a hike since there are so many hikes closer to home. However, as you indicate in your response, it is indeed great to have day-hike options available in both Maine and Vermont. Best review of this trail anywhere. We used it last year and heading back again. The friends...link is down , so you are the only trail map as far as I know. Thank you for providing this. Dobby, many thanks for taking time to post your comments. It’s always gratifying to receive feedback about my blog.